Franklin Perez, 29, wearing a blue jersey, poses with his family in their home, after he was released to house arrest, in Managua, Nicaragua, April 5, 2019. Perez is among the 50 released Friday who had been jailed for protesting against President Daniel Ortega's government. Nicaragua on Friday released another 50 people jailed for protesting against President Daniel Ortega’s government, bringing the number freed since late February to about 200 in a unilateral action separate from a broader deal covering hundreds considered political prisoners. 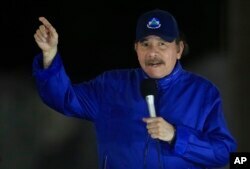 Nicaragua's President Daniel Ortega speaks during the inauguration ceremony of a highway overpass in Managua, Nicaragua, March 21, 2019. Luis Alvarado, alternative representative from Nicaragua to the Organization of American States, said the prisoner releases are “proof of the commitment of the state and government of Nicaragua with the agreements reached so far” in the talks. Documents signed in the recent talks between the government and the Civic Alliance opposition coalition call for the International Committee of the Red Cross to propose an updated list of prisoners who should be freed by mid-May. Azahalea Solis, a leader of the Civic Alliance and negotiator at the talks, said Thursday had her group received a “reconciled” list of people considered political prisoners. In Washington, Joel Hernandez, rapporteur on the rights of persons deprived of liberty for the Inter-American Commission on Human Rights, called for a complete accounting of those arrested that is agreed upon by all parties. “The commission believes that the release process must be ordered, expedited, transparent and offering certainty on the legal status of those freed,” Hernandez said. The Civic Alliance has said that 779 people were arrested because of the protests, while a truth commission formed by the government says there were 261. Ortega officials have accused protesters of being “coup-plotters” and “terrorists” bent on toppling his government.